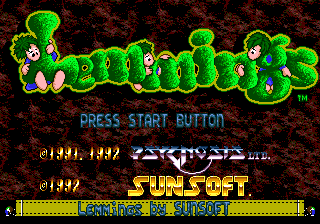 Lemmings (レミングス) is a very successful strategy game developed by DMA Design and published by Psygnosis in 1991. It stands as being one of the most ported games in history, seeing a release on dozens of platforms including the Sega Mega Drive, Sega Game Gear and Sega Master System. The player's task is to guide a number of Lemmings to a goal, trying to make sure they do not kill themselves during transit. Lemmings can be set to do certain functions such as digging or blocking, though the user only has a limited number of these moves in supply. The Sega versions are slightly stripped back from the Amiga original, particularly on the Master System, where music and level layouts are slightly adjusted. The Master System version also lacks a map, and cuts back on the amount of Lemmings on-screen (the compensation being an adjusted difficulty level, i.e. fewer Lemmings need to be saved). All three versions add new levels specific to each platform. The Mega Drive version has a special stage featuring the characters from Sunsoft's Hebereke series. Neither version supports any form of mouse (or trackball) control. NEC Retro has more information related to Lemmings.